Nicaraguan Katia Cardenal Shares Messages of Hope through Music | The Gettysburgian. 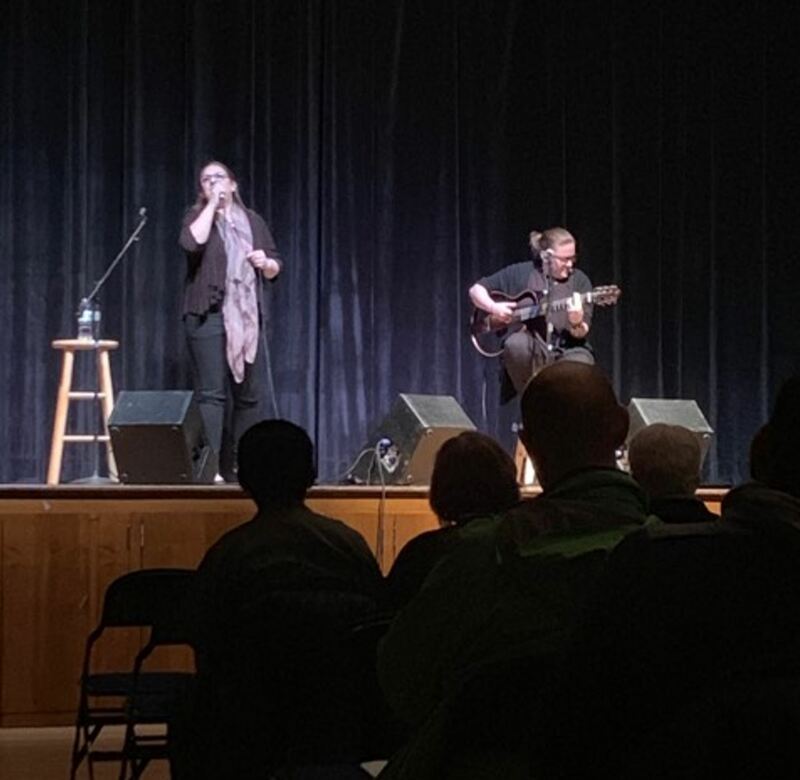 Katia Cardenal and her daughter, Nina, graced the College Union Building Ballroom stage with only a guitar and two microphones in hand on March 20 at 7:00 p.m. The Nicaraguan pair performed emotional songs in Spanish, some written by Cardenal or her brother, that shared common themes of love and hope. Cardenal and her daughter left Nicaragua in June of 2018 in a time of government-caused violence and repression. They have been performing in concerts around the world, speaking up for their beliefs, ever since. After a three-month hiatus in Norway, she continued her tour with us to sing songs with messages about protecting the environment and human rights. During the performance, Cardenal introduced each song in English, including an anecdote about how the song came to be or its importance in her life. She then quoted some of the lyrics, translating them to English, to explain the meaning behind the poetry. Audience members received programs containing many of Cardenal’s common songs with lyrics in both English and Spanish for reference. The audience also had the chance to read Cardenal’s biography and learn more information about one of the co-sponsors, Project Gettysburg León. Although many of the songs were written by Cardenal’s late brother, Salvador, she performed one of her first original songs, “Mariposa de Alas Rotas.” She explained that this song helped her face her fear of being a female singer and songwriter. She shared the message of the song: we are all like a butterfly with broken wings; we all have the ability to fly in a storm. Some of Cardenal’s music connected back to her Nicaraguan roots. She remembers a time when she would visit Lake Nicaragua as a small child, admiring the trees and luscious island and learning to crawl on the sand. Now, her songs contain messages about preserving the Earth, such as “Canción de Fuego,” a song that gives the silent trees a voice so that others may know that they are being turned to ashes. Overall, Cardenal wished to instill hope in each listener and inspire love in others’ hearts. She spoke about the political strife in Nicaragua and the power of bad people in the world. One song in particular was about planting flowers of hope and love in a land of war and divided people. Cardenal and her daughter poured their hearts out for Gettysburg with their songs and inspired the audience to spark change in the world through hope and love for all.